When we last checked in on the Crunch Berries/Froot Loops line of cases, which allege that the marketing of these cereals leads people to believe they contain significant amounts of fruit, eight such cases had been filed and the plaintiffs' record stood at 0-6 with two cases pending. It didn't take an octopus to predict that the record was going to get worse, and last Friday it indeed went to 0-7. 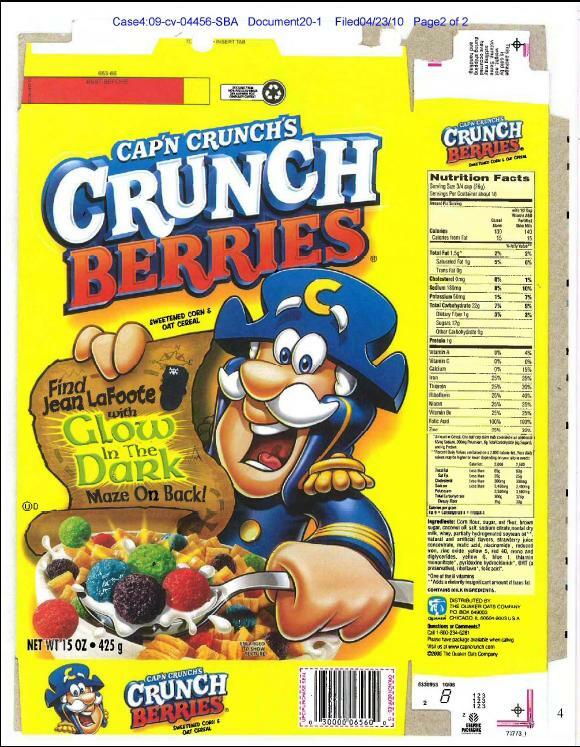 As Judge Saundra Armstrong noted in her opinion, this case was the third in a series of proposed anti-Crunch-Berry class actions filed in California, although each case featured a different named class representative and was filed in a different federal district. The complaint in this case was virtually identical to the other two. Not surprisingly, the dismissal of those prior cases was mentioned by Judge Armstrong in her opinion Friday. Also mentioned by Judge Armstrong: the words "nonsense," "entirely misplaced," "equally uncompelling," "would neither be reasonable nor justifiable," "frivolous," "bad faith," "inherently flawed theory of liability," "forum shopping," and, not surprisingly, "dismissed with prejudice." Plaintiff's lead counsel was quoted as saying that he had "no plans to appeal or file any future action on these claims." I notice that does not quite rule out an appeal or a future action on "these claims" by somebody else in some other court, but it does suggest those are not likely. The statement also carefully avoids taking a position on other current cases, most likely because case number eight is still pending. For now.